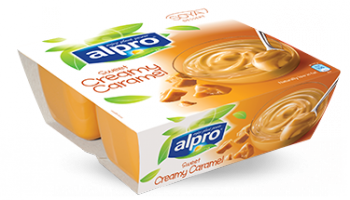 Alpro Caramel dessert is made with only the finest ingredients, so this delicious, plant-powered dessert is a real treat for your customers' taste buds. It's also a source of plant protein, calcium and vitamins B2, B12 and D, and low in saturated fat - so guests can indulge in a great caramel flavour without feeling guilty. The Alpro Sweet Creamy Caramel Dessert can be sold separately to extend your range and boost your profits.